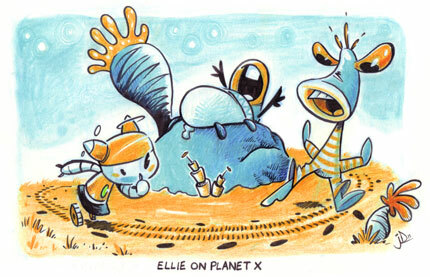 Joel Duggan, one of the three creators who interviewed me for Comics Coast To Coast, sent me his interpretations of Ellie, Jeff, and Muffin using the newly christened Sorbet Pallet (or was it Sherbet (or Sherbert, as we say in the Mitten State)) that I use. Anyway, what was I saying? Oh, yeah…I was bowled over by the incredible job he did. It’s this kind of thing that really makes doing Ellie so much fun. And please go visit Joel’s wonderful comic Starcrossed. It’s so well drawn and just darn funny. His character designs really show off his animation background. And just so you know, it’s PG-13. Consider yourself informed. Would we call Starcrossed adult themed? More like PG-13. It’s definitely safe for work! PS: Are you on Twitter yet? I reserved the name! Little steps.